Each dress in our signature Ronald Joyce collection has its own individual style and character, tailored to suit every bride. Each dress in our signature Victoria Jane collection has its own individual style and character, tailored to suit every bride. For the understated bride, our Sofia Bianca collection offers a selection of classic bridal gowns to take your breath away. Ronald Joyce has developed over the years offering Bridal, Bridesmaids and Occasionwear collections and remains a prestigious British Brand. Internationally renowned Designer Veni Infantino, loves to make Ronald Joyce brides’ dreams a reality and there are a variety of styles and silhouettes featured in the collection to suit every brides specific needs. Elegant, feminine and timeless perfectly describe the Ronald Joyce and Victoria Jane bridal collections. Inspired by Veni’s love of fashion and glamour, the sophisticated designs are complimented with exceptional embellishment, romantic flowing skirts and impeccable detail. The collection is designed to embrace a wide selection of shapes and tastes, including modern clean lines, traditional fairytale ball gowns and complemented with structured tailoring. 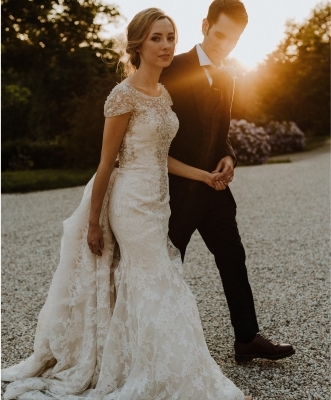 Shape and colour coordination including Blush and Light Gold offer an alternative to the traditional Ivory and White and enhance the statement of the dress. Ronald Joyce is one of the UK’s finest wedding dress brands, offering a range of affordable luxury dresses. The collection features detailed backs, a selection of beautiful sleeves, illusion necklines and stunning fabrics including Lace, Satin, Chiffon and Organza. Key Design features include statement low backs, overskirts to create two different looks, detachable Body Suits, Tone on Tone beading and matching veils. Unmistakably elegant and feminine, Veni Infantino's brides are always unique, stunning and indisputably sophisticated. Ronald Joyce are proud to be part of the most memorable day of a woman’s life. Interested in exploring more of our dresses?